Sleep disturbances with mild, moderate and severe brain injuries are one of the most disturbing symptoms following brain injury and are three times greater than the general population. Are sleep problems taken seriously? Inability to sleep is a severe untreated condition in this population that lasts from months to years. Sleep problems cause an impairment in daytime functioning and may impede all attempts to return to normal daytime activities. It’s always easy to blame depression as the cause. If you can’t sleep there is a hypersensitivity to pain and depression. It’s likely that the lack of sleep causes depression. Who wouldn’t be depressed when the brain is injured and can’t rest or sleep regardless at every attempt to promote sleep? Wouldn’t it be great to solve this problem with sleep? With proper sleep lives may return to some sense of normalcy. Again returning to become a contributing member of society. That is the goal of TBI survivors. There is NO secondary gain to having a brain injury. Patients do not overestimate the severity of their sleep disturbances. Subjective complaints by the patient are more reliable observations of sleep deficits than objective EEGs and other research tools currently being evaluated. The objective data does not measure significant problems with sleep. Are patients ever asked what works and what does not that would appear in studies or literature so others can be helped? Without the proper sleep these patients cannot function with even the simplest tasks on a daily basis. When they have a good night sleep they have a false sense of feeling good, then the bottom drops out with the next night that sleep does not occur. The one good day, always offers hope. TBI survivors depend on sleep to think or have any energy during daytime hours. Without sleep, survivors cognitive performance is impaired. The degree of sleep problems is most likely related to neuropsychological functioning. Unfortunately, the blame is on the personality of a mild traumatic brain injury instead of the neuropsychological functioning. In severe brain injury survivors seem to be considered unreliable sources. If severe brain injury survivors are not taken seriously, how do we know that sleep disturbances are more prominent in mild TBI? Who is reporting for these patients? I dispute the fact that severe brain injury survivors are not reliable sources. These patients know what is happening, they just have slow processors. It’s time scientists move away from the psychological factors of sleep disturbances, and move into the physiological damages that occur with brain injury. What is the correlation between endocrine and neurological systems that may resolve the sleep disturbance issues? Is there hypothalamic damage that cannot be visualized on MRI or CAT scans, hence remain undiagnosed and untreated? Does treatment for endocrine related problems improve sleep in the TBI population? Sleep disturbances persists for months and even years. It is not just immediately following injury. This is a major health problem. Our TBI survivors deserve to have a successful treatment for sleep disturbances. With a resolution of this problem millions will be able to function on a daily basis. Is mTBI versus severe TBI sleep disturbances really worse? Is it a misdiagnosis of an injury to the brain that remains unidentified, hence the patient is consider to have a mild traumatic brain injury. Ultimately, sleep disturbances are a major health concern. Sleep promotes the healing process. Routine-Wake up and get up same time daily. Go to bed same time daily. Are you dealing with sleep disturbances? What is helping and what is not? How many years have you been dealing with it? Perhaps the cpap does not work for tbi survivors because it deals with swollen throat, overweight, flaccid tissues, etc., usually associated with old age, whereas the cause of tbi sleep deprivation could be a neural thing, such as the brain portion that shuts down the body for sleep is disrupted in some way. Lastly, proof that tbi causes sleep deprivation causes tbi: Your chart! 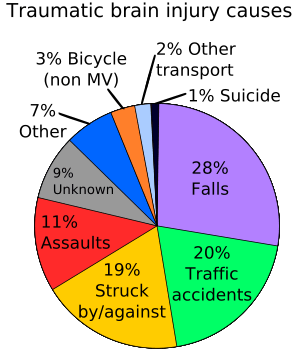 I thought the title, “Traumatic Brain Injury Causes” meant these things are CAUSED BY tbi, as in, Traumatic brain injury causes falls, traffic accidents, . . . Then I realized it really meant, Falls cause traumatic brain injury. Traffic accidents cause tbi, etc. BUT HOW INTERCHANGEABLE ALMOST THE WHOLE CHART COULD BE! Where is sleep on that chart? Could the so-called “self discipline” that induces people to think they need less sleep actually damage the brain? Train it not to sleep? You’ve raised some great points. It’s likely the brain portion is damaged that would normally promote sleep, hence disrupting normal sleep patterns. Since mini-strokes are a form of brain damage they to could cause sleep disruption. I wish I could take credit for the chart, but I used that from TBI! :) Wow, I never thought about the effects of less sleep as self-discipline causing brain damage, but that’s something should be studied. Before injury I never slept more then 4 hours a night, but it seems hereditary … may be not, it comes with burning the candle at both ends! I’m contemplating all your points. Thanks for offering some great insight. If only I were alseep right now, I’d let this go until morning! 😀 However, I really am tired and think I might drop off .. . I started sleeping less when I found that 8 hours would give me a migraine. I did much better with only six. Then I got so busy, I sometimes dropped it to 5. But if I added sleep either in the evening by retiring early, or in the morning by sleeping in, the headache would return. That still happens, but I choose to sleep and ignore the headache. Ah well. Wow! That’s amazing how sensitive the brain with too much or too little sleep causing headaches. It’s interesting how everyone needs to figure out what happens with their own brain-body connections and be responsible for their health. You share such good facts and all your comments are appreciated. Hope this night is a restful one! Thank you for the ping back. I also stopped by to visit your site and find it has a lot to offer those with brain injuries. I will recommend my readers to stop by and check your site out. I wasn’t aware of the “falling snow” and right now I don’t know how to turn them off. That hasn’t been on this site in the past and who knows when it changed. I must agree it is distracting and I only dealt with them for a few seconds. I can’t deal with changing things right now, but I certainly appreciate your comment. If anyone knows how to turn them off please let me know. Again, thanks for bringing this to my attention. Take care and stay safe. 1. Go to your dashboard. 2. Scroll to the bottom of the menu on the left side. 3. Hover your cursor over “Settings”. The icon looks like to arrows, one pointing up and the other, down. 4. From the drop-down menu that appears, select “General”. 5. At the bottom of the window that opens, you will find a choice called “Snow Show snow falling on my blog until January 4.”. The box should be checked, since you are getting snow. Un-check it. Thank you so much for the clear and concise directions. I feel like I’ve accomplished a great deal today with your help. I am ever so grateful that you’ve been so helpful in many ways, including this example of reaching out to teach when I am having great difficulty with simple things. You are angel. Take care and stay safe. Well, you are welcome! I can imagine the snow being a distraction, although I love it for my site. However, you are still getting snow…?